Eurohunts of Madrid Spain has donated a 4 days Roe deer hunt in Spain and Flamenco Dancing show pass for 1 hunter and 1 non hunter. This is 4 day 1×1 rifle hunt, including reception at the airport by Eurohunts team/staff in Madrid, clearance of guns, professional (1×1) English speaking hunting guide, local guides/rangers with SUV & 4×4 cars, all ground transportation including airport transfers, luxury country style hotel set in a privilege position near the hunting area, all meals including Spanish wines and spirits, trophy fee for one Roe deer, trophy field preparation and scoring by SCI Master Measurer. 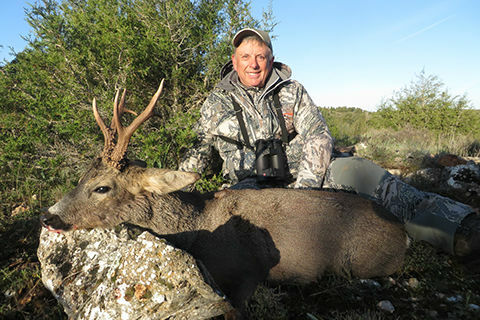 Long well-known free range hunts specialist and long-time SCI supporter Spanish outfitter Alvaro Villegas is providing a great hunting and sightseeing experience for hunter and observer in one of the best worldwide hunting destinations. Spain has some truly exceptional natural resources, home to the second most UNESCO-designated Biosphere Reserves– you’re guaranteed to find everything: lakes, mountains, volcanoes, marshes, forests, valleys, cliffs… Spain’s wide diversity of landscapes will never cease to amaze you. This hunt can be extended with great opportunities, including 4 Spanish Ibex (Gredos, Beceite, Southeastern and Ronda), 2 chamois (Cantabrian and Pyrenean), European fallow deer, Red deer, Iberian Mouflon sheep, Balearian goat and Aoudad sheep as per current price list. Additional hunters welcome per current price list. The hunt takes place in the best private hunting reserves in the states of Cantabria, Asturias and Castilla y Leon. Schedule dates are spring 2019 or 2020. Not included in the value non-resident state hunting license $180, mandatory hunting insurance $100, medal category tag, trophy taxidermy, hotels after or before the hunt in Madrid if needed and 21% V.A.T on the hunt value. Alvaro has been guiding since 1999 and has become a benchmark of the best mountains hunts in the country, with 99% trophy success and with extraordinary quality of trophies. SCI references include Fred & Shari Burd, Craig & Donna Boddington, Bruce Keller, Suzie & Bill Brewster Jim Shockey, Barret Simpson, Mark Metzger, Page Mays, Albert Cheramie, Matt Ward, Cliff Tulpa, Gary Neal, Loren Rutlegde, Mike Harp, Cliff Neuse, Ted Lyon, James Fero, Bela Hidvegi, Joe Aquino and more. Eurohunts will make this hunt trip an unforgettable experience for the hunter and the non-hunting companion.